Allow customers to set their own service reminders to come back to YOUR STORE!! Many shops are asking for in-store promotional material and Oil Change app Logos and links to the apple store for their own email marketing and websites. This will be very important when the new version comes available because of the customer reminder feature. When a customer selects a reminder, the app will reminder them to come back to YOUR store! If they don't know to use the app, it will just tell them it's time for your next oil change service. So tell you customers to use the app when they come in. For those of you who have emailed me to ask for promotional materials, they will be mailed to you soon. 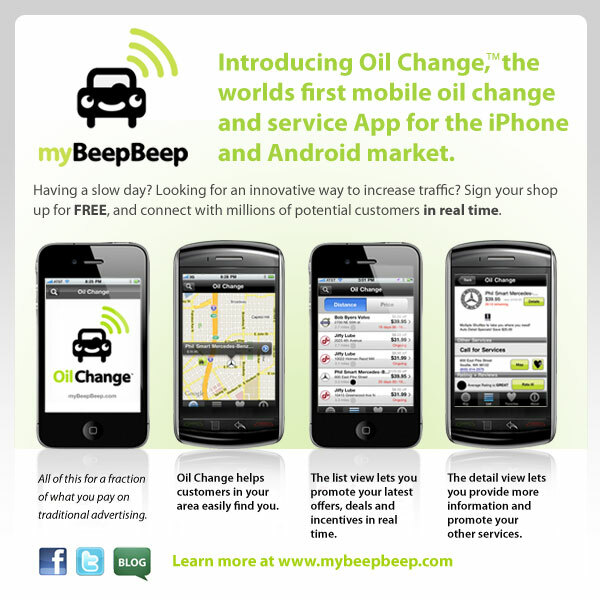 We would love for you to tell you customers to use the oil change app so just reply to this email and I'll send you an in-store shelf talker and window magnets and I'll put Logos and a link on the mybeepbeep website for you. You will also see some changes to the website to help you get the most out of your listing including tutorials and help pages.